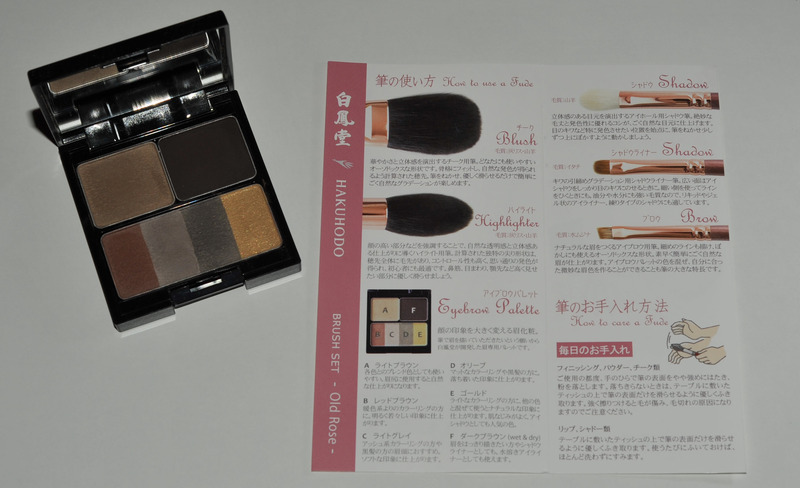 This Hakuhodo set has just been released, they have called it the “Winter Set 2013”, the particularity of this set is that it does not only contains brushes but also an eyebrow palette. I only got it yesterday so I won’t be able to give you a very detailed review on it but since it’s LE, I think I should show you some pics as soon as possible in order for you to get your hands on it if you were looking for a set like this. 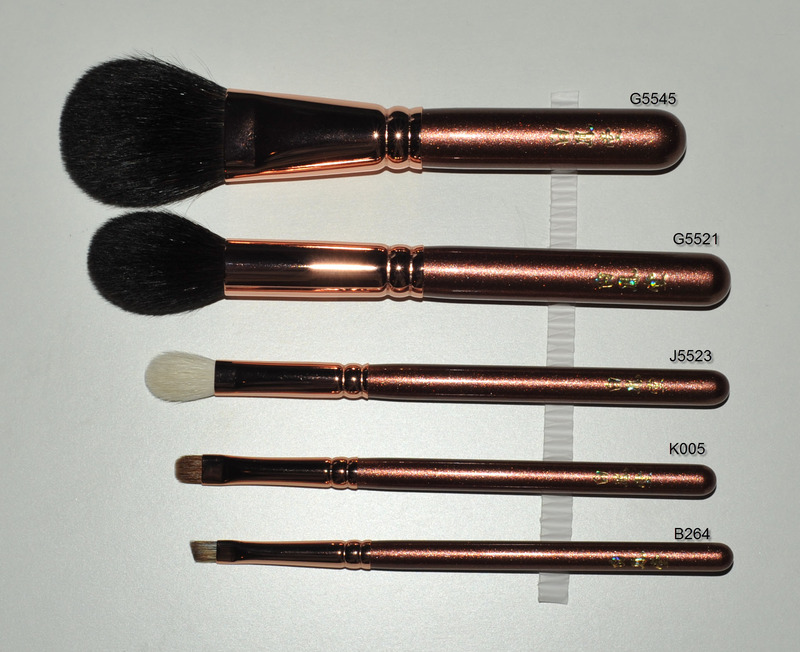 This set includes 1 eyebrow palette, 5 short handle brushes in a copper-rose-gold color and 1 enamel brush pouch in the same color. 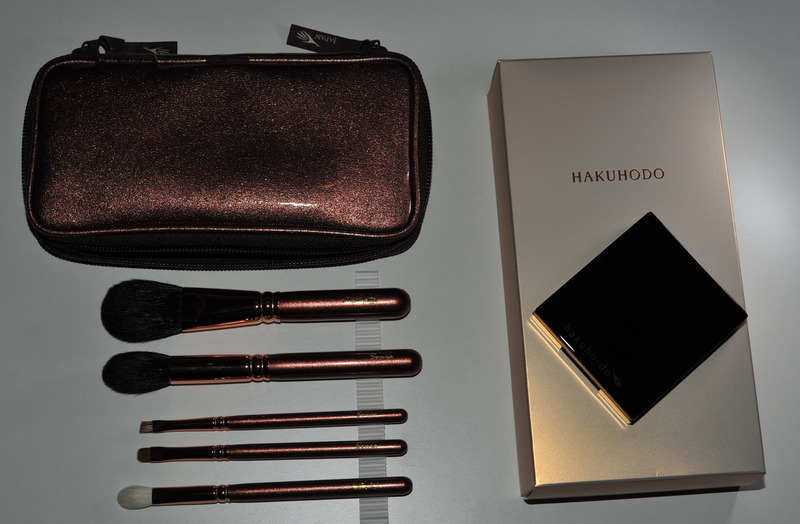 I got mine via Hakuhodo Japan that’s why I had the possibility to have my brushes engraved with my name, it’s an option that Hakuhodo Japan offers you (I believe free of charge, I did not see a mention of the price anywhere). Keep in mind that Hakuhodo Japan only ships to Japan – as far as I know – but this set has now also become available in Hakuhodo USA. 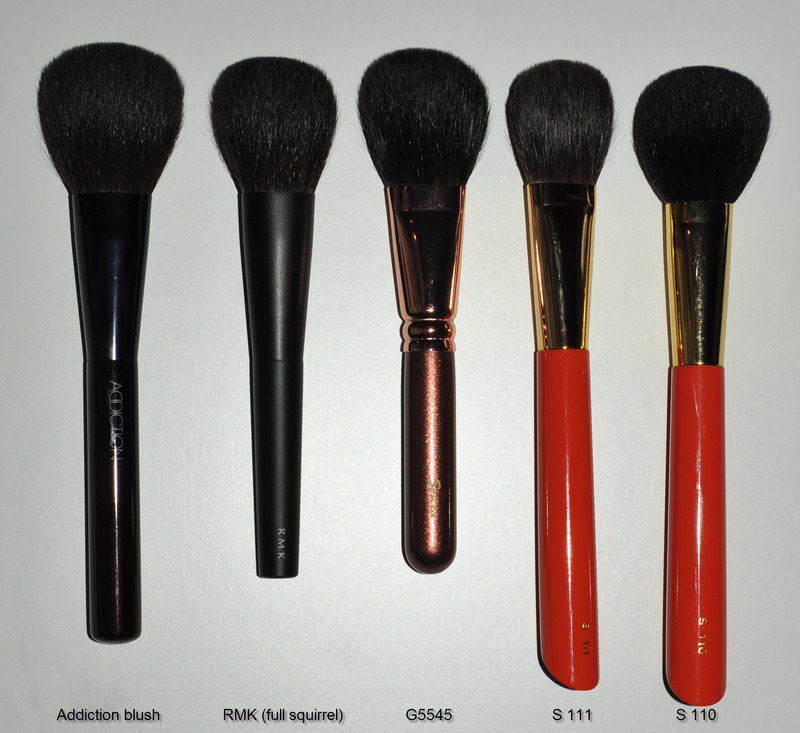 The pouch size is nice (approx 18cm long, 8.5cm large) but only smaller brushes would fit inside. 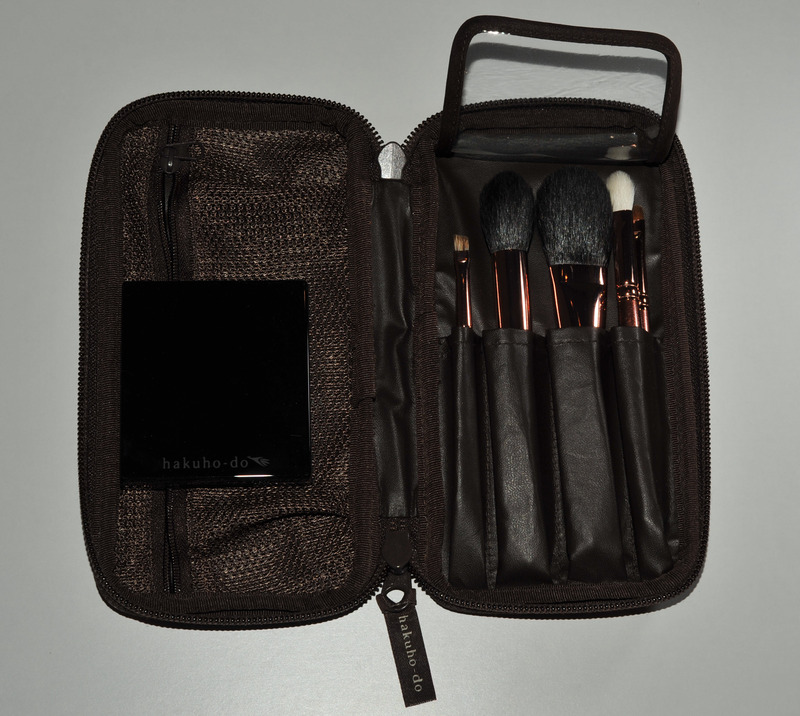 It’s just the right size for me because it holds exactly the number of brushes I would take with me for a short trip (or when I am going out in the evening and want to change my makeup), the left zipped compartment is perfect for foundation brush(es) or thicker powder brushes. 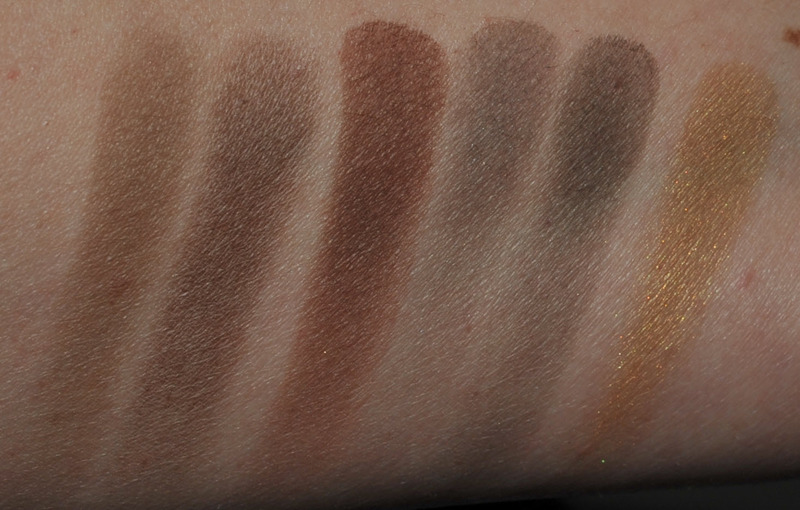 It was not love at first sight, I was hoping for more pigmented/silky textures or luminous shadows, but this is an eyebrow palette after all, the texture of the shadows is totally appropriate for brows, I have tried the darkest one as an eyeshadow (all-over lid) and it does not really apply evenly. 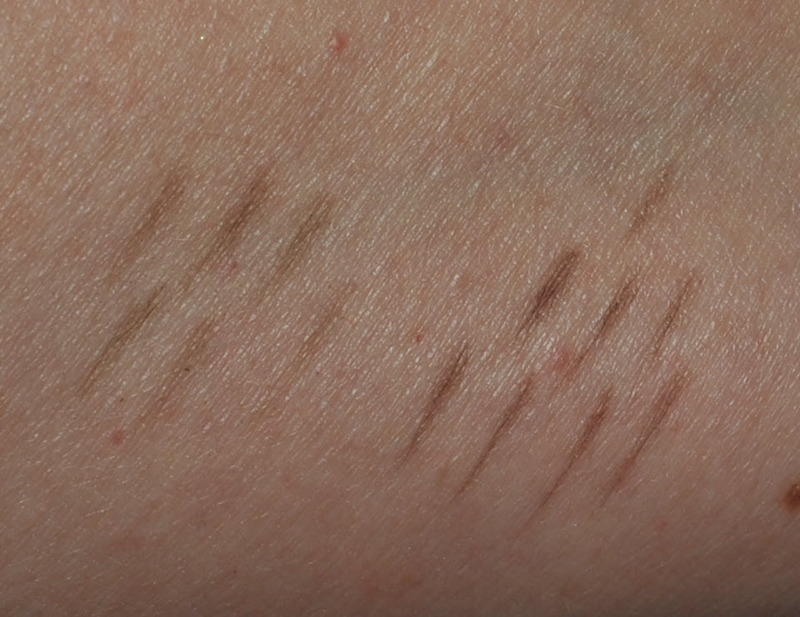 They did leave a nice stain on my arm when I was doing the swatches so that’s a sign that they are quite long-lasting. The selection of shades is meant to cover all the needs, for any skintone/brows that I can think of. The light brown is to blend with other colors and for the outer end of the brow. The dark brown is for defined brows and can be used as eyeliner. The red brown is for those with auburn hair. The light grey is for ash blondes and also for the inner end of the brow for those with black hair. The muddy green is for those with black hair and the gold which has shimmer bits can be used for shadow or even to mix with other colors. (I tried that and think perhaps slightly shimmery eyebrows could work for a dramatic look.) Of course, you can blend any of the colors with each other to get the shade you want to match your particular makeup look of the day. 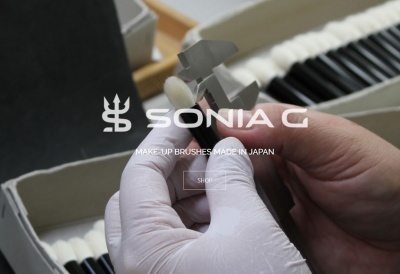 For those who have a low bridge, the light brown, like the light brown in the Suqqu palette, can be used under the brow next to the nose to contour that area and give the appearance of a higher bridge. I have tried the darkest one but it’s a bit too strong for me so I mix it with a lighter shade then it’s perfect. I actually don’t do much on my brows, they are naturally quite full so I just fill where I really need to. My brows are not exactly very feminine but I think they match my face and I am lucky I don’t feel the need to do much on them on a daily basis. When you swatch the shadows with the eyebrow brush, the result is precise and natural, the width of the line is buildable, you can do a very light thin stroke or slightly larger ones. It is firm but it does feel soft for a water badger brush, I mean softer than many eyebrow brushes I felt. 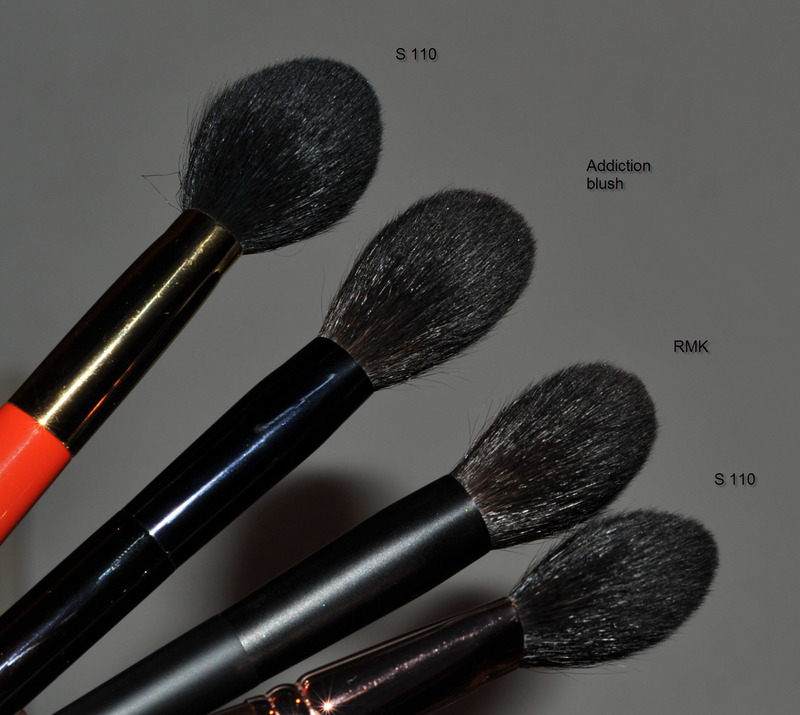 I enjoy the selection of brushes in this set. I already had the G5521 and the J5523 but since these two are must-haves for me I am happy to have smaller versions. Blue squirrel/goat, it’s soft but still firm, much thinner than the S 110 and also softer. 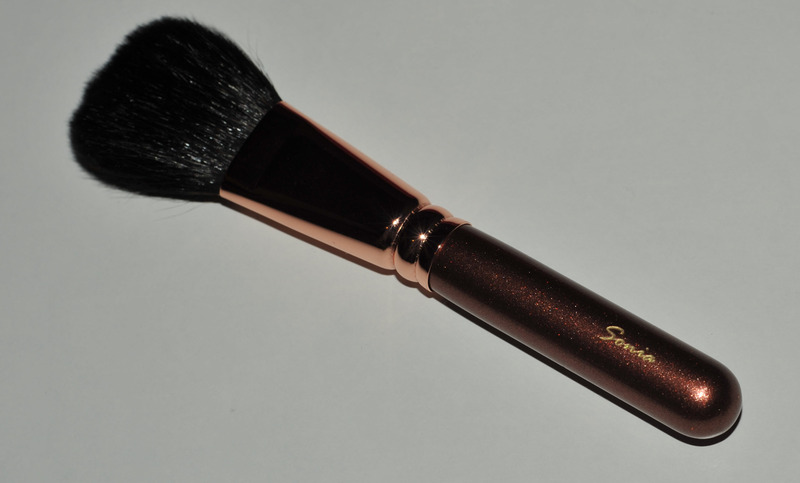 I used it with bronzer and blush, for blush I have used it with a matte blush in a “pat” motion, then blend. Nothing special to say about it, it worked well. I’ll rather pick a denser, more rounded brush for blush, like the RMK or the S110 for example but I also enjoy this one, it’s more multipurpose since it’s more flexible and delivers a more diffused application. It’s the same as the G5521 from the current line (both are blue squirrel/goat), the handle is shorter. 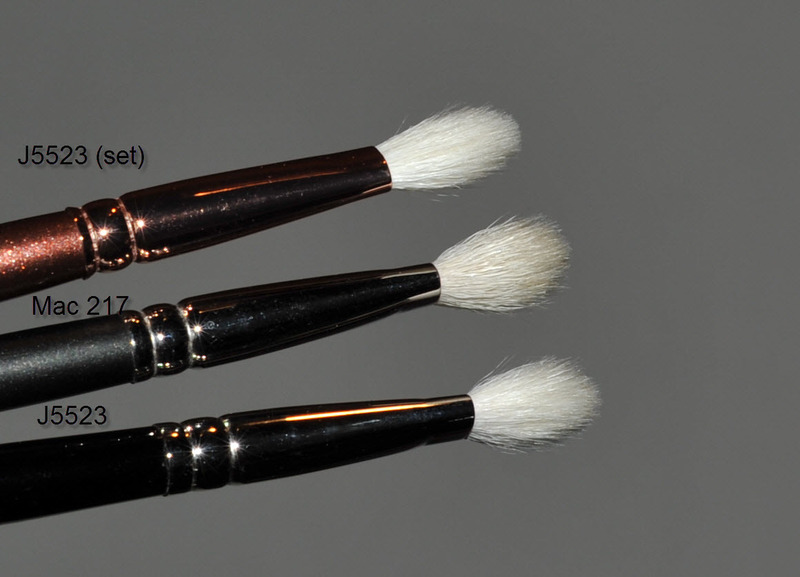 It’s a must-have brush for me, but I even prefer the J5521 (white goat) version of it. The Z-2 feels softer, is slightly more pointy but the G5521 blends a little bit better since it’s a bit firmer and denser at the tip. Well, what can I say, yes it’s a must-have. I hope that in the longer term this brush will keep it’s shape, if it does, this one is going to enter the best all-time brushes competition. Water badger. 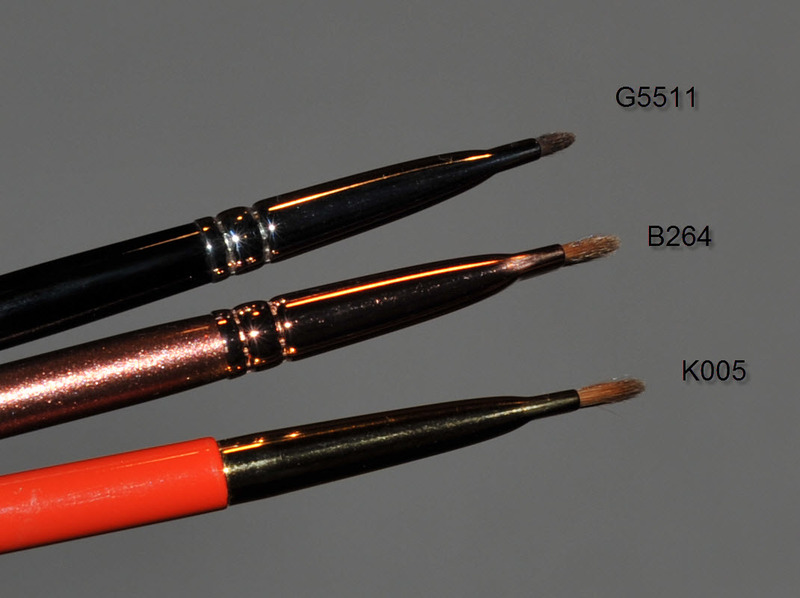 I don’t have many eyebrow brushes so I am pleased to have a smaller, more precise brush than the Chikuhodo Z-6. 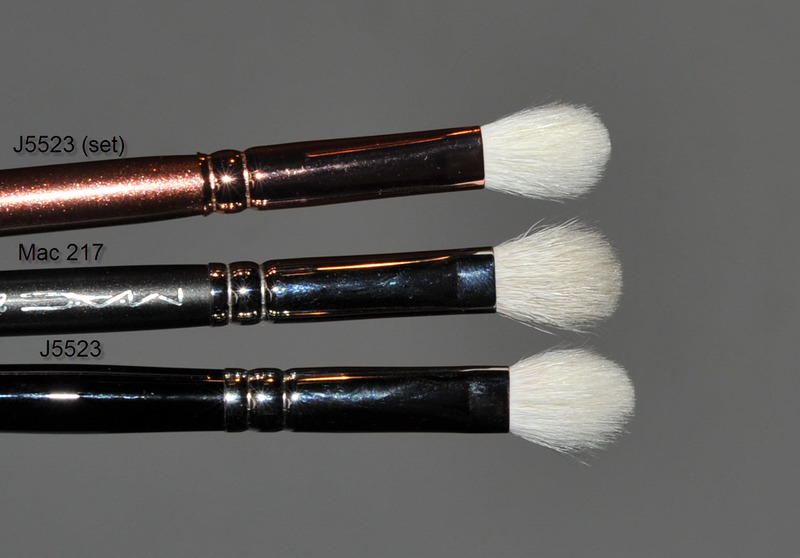 If you buy these brushes separately with the pouch, they would cost you 169 usd, if you buy the set : 179 usd. The palette would only cost 10 usd, in that case it’s a great deal. 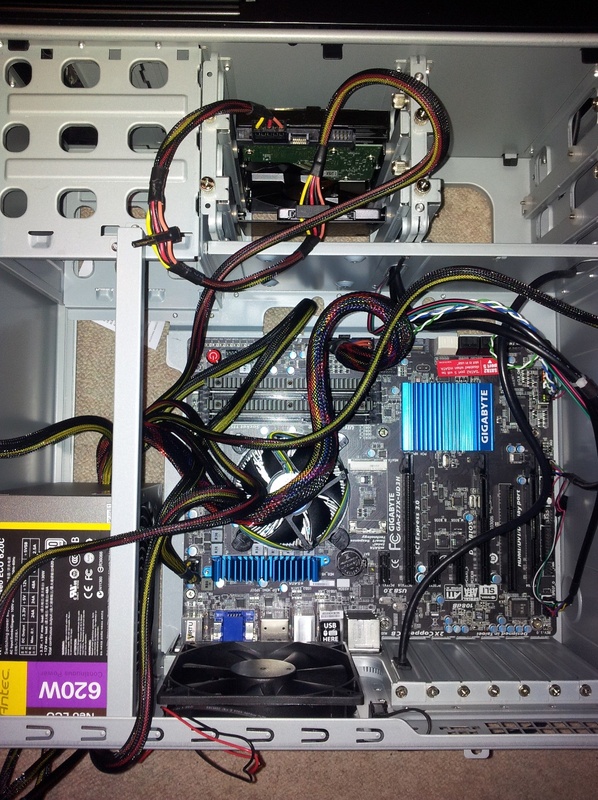 It’s not a bunch of snakes in a nuclear plant, it’s my new computer being built !!! a killer machine ! It should be ready for the weekend, finally I will be able to post more often ! Hakuhodo Winter Set 2013 – Limited Edition was last modified: August 18th, 2013 by Sonia G.
How about a Sisley Orchidee under your Christmas tree ? Oh noo, sorry about that !!! I really need to pay more attention to what I am doing 🙁 it’s corrected now, thank you so much for telling me !!! I do the same, small orders… they know me at the PO, as soon as I enter the main door they are already preparing the parcels 😛 well, it’s a very very tiny place where I live too so… it’s not that difficult ! Thanks for all of the pics and swatches! I’m excited for my mail to come!! 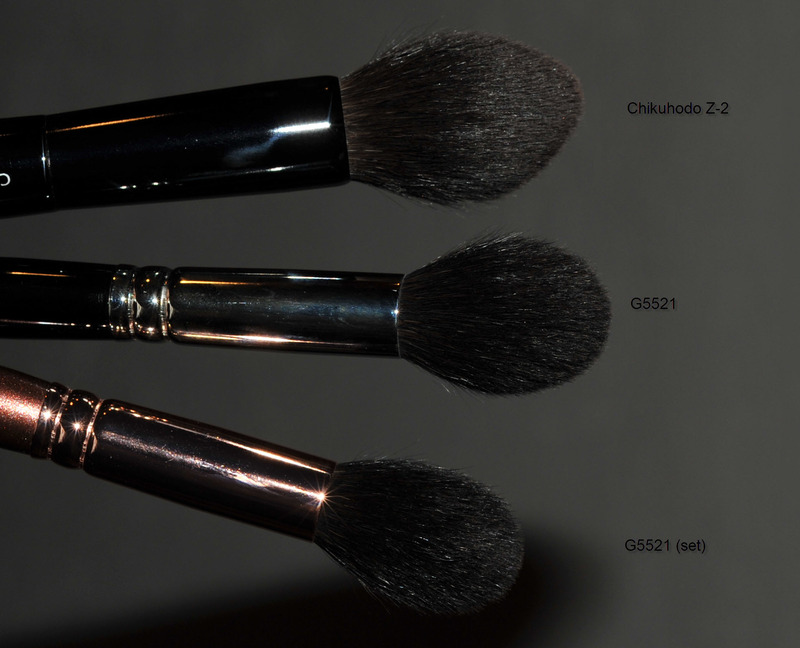 Hakuhodo should make some make up to go with their brushes 😉 They’ve also put the G5545Bk on the USA site but it seems quite flat, as you I prefer rounder brushes. The set is good value for money though. A good eyebrow product is so difficult to find and this palette is finally quite multipurpose. Hi Sonia, excellent review and I love the comment your boyfriend made 🙂 Just wanted to add that I purchased my palette in Japan for $34 so this set is a good deal. Oh no, I would be terrified the day Hakuhodo starts making makeup. 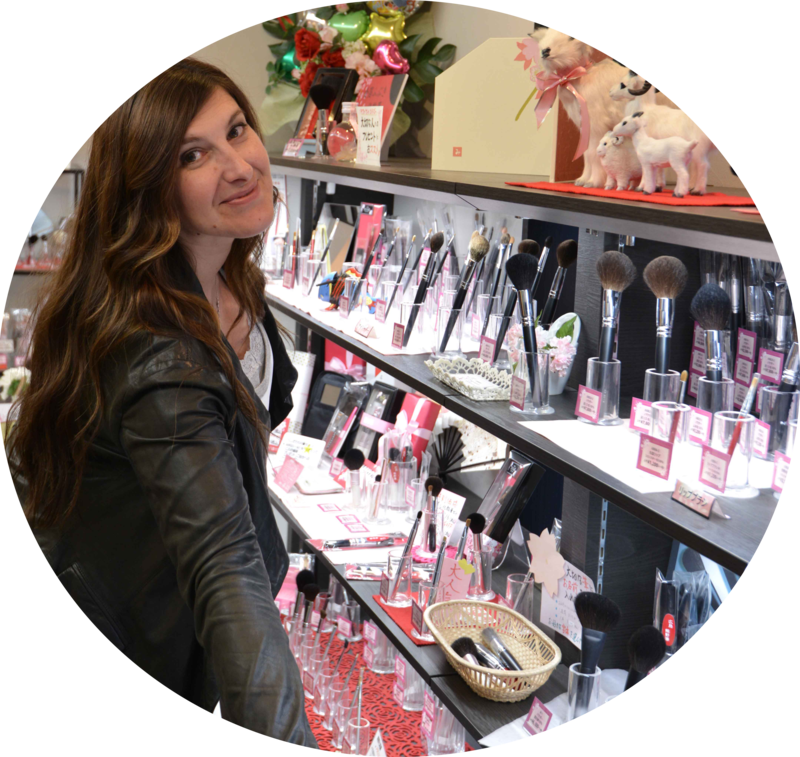 With the track record in beautiful brushes, I’m pretty sure their makeup will be lovely and I don’t think any of us could really resist. I’m not sure about the Xmas set. I think I should have passed on this one.